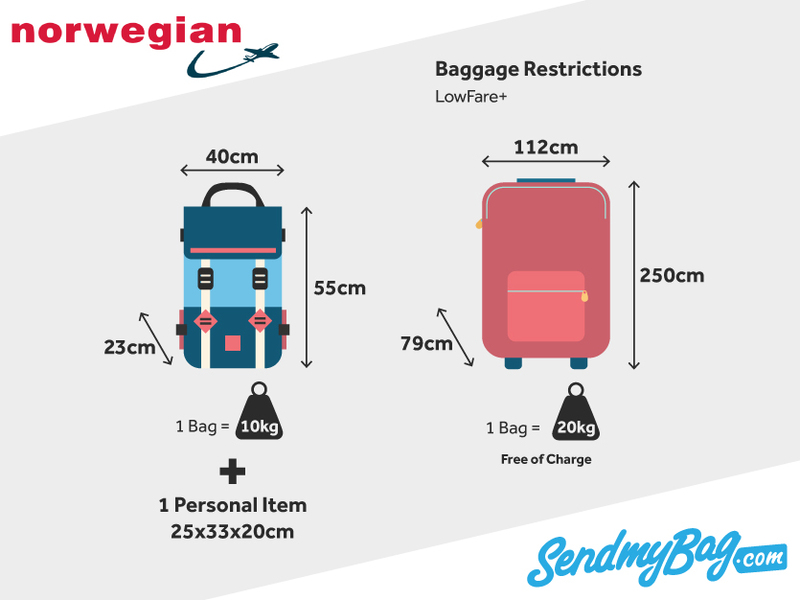 Why not send your luggage to your destination and not have to worry about Norwegian's baggage allowance? Eliminate the possibility of paying excess baggage fees and get to travel luggage free! Get your quick quote for luggage shipping now! One piece of cabin baggage measuring no more than 55 x 40 x 23 cm and weighing a maximum of 10 kg, or 15 kg on Flex fares. Passengers may also bring on board a small personal item measuring 25 x 33 x 20 cm. Note that if you are travelling to/ from Dubai, your hand luggage may only weigh 8 kg. If a flight is very busy with a lack of overhead locker space, you may be asked to check your bag into the hold. Infants under two years of age do not have their own hand luggage allowance but you may carry baby food and /or milk for them to consume during the flight. Small musical instruments can be brought on board as hand luggage. These may be slightly bigger than standard carry-on luggage but must not exceed 90 x 35 x 20 cm. A larger instrument, up to 140 x 46 x 30 cm may be brought on board if an extra seat is purchased for it. There is no additional hand luggage allowance for infants under the age of two years, travelling on your lap. However, you may bring a reasonable amount of baby food and milk/ formula for the flight. LowFare ticket customers must pay to check their baggage into the hold. LowFare+ customers may check one 20 kg bag and Flex and Premium customers may check two 20 kg bags. Checked bag dimensions must not exceed 250 x 79 x 112 cm. Infants under two years of age are given a 5 kg checked baggage allowance, either in a separate bag or included in the luggage of the accompanying adult, plus one car seat and one buggy. If customers purchase baggage allowances at the airport, these will cost £40 per bag for domestic flights and £70 per bag for international flights. The cost is higher if travelling on a connecting flight. Baggage allowances can also be purchased online, which prices depending on the route and number of bags. Checked bags that are over 20 kg will incur a fee of £9 per kilogram. This also applies to customers checking more than two bags into the hold. No bag may exceed 32 kg for health and safety reasons. The checked baggage allowance for infants not travelling in their own seat is 5 kg, either packed within the accompanying adult's bag or within their own bag. One car seat and one stroller can also be checked for the infant, free of charge. Looking for Norwegian sized hand luggage?